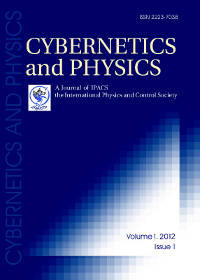 Journal Cybernetics and Physics (CAP) is published under umbrella of the International Physics and Control Society (IPACS). The scope of the journal includes all areas related to Cybernetics and Physics. Prospective authors are invited to submit high quality papers on applications of cybernetic methods to physical sciences and technologies. The papers in cybernetics with physical flavor as well as the papers in physics with cybernetic flavor are welcome. Frequency: 4 issues per year; the issues are typically released in the 2nd quarter, 3rd quarter and two issues in the 4th quarter of each year. The journal is peer reviewed, indexed by Scopus and DOAJ. The journal does not charge article processing or submission charges. The journal adheres to the BOAI definition of open access: users have the right to "read, download, copy, distribute, print, search, or link to the full texts of all articles".